Right now I am home in Chicago, which is a blustery and snowy escape from sunny Savannah. I went to my aunts' house the other day, and she has this beautiful victorian house. Their house is like a giant warm hug, the rooms are all full of character and family. I love their creaky and twisting staircase that is completely lined with family photos from a variety of eras. There is a black and white photo of a handmade grade school play most likely from the mid fifties. My aunt Joann hovers in the back almost hidden amongst the children in handmade and eclectic costumes. There is so much character in the photo, the lead actress looks like she is drinking in her first taste of 9 year old fame. Her pose has the finesse of a black and white film starlet. There is character in these photos, there is colorful fashion of children and adults of different decades. The amount of photos is amazing, but even more amazing in the thin thread that connects me to all of them. I think family history is so beautiful, I think of each ancestors traits as a gift to the future generations. Maybe my great grandmother who was a daughter of the american resolution was stubborn like me. Maybe my brother, Matt, has my paternal grandfather's intellect and curiosity. If you don't get stuck in the wonder and beauty of these photos, you might notice at the top of the stairs a little framed quote that reads, "The guardian angels of life sometimes fly so high as to be beyond our sight, but they are always looking down upon us." I think family history can be a good way to stay present, I think of all of these ancestors as guardian angels and how they had such wonderful hopes for me. It specifies you and takes you out of the crowd, you are part of this lineage and part of this push for the future adventures. Women on my dad's side have always been creative. I remember feeling so special when I was 10 years old and teaching myself to make ornaments that looked like beaded fruit like my grandmother had made. Whenever I have received anything from previous generations in my family I have felt their love for me when I used the heirloom. Not in some weird psychic way but in this is a quality archive of that time, and someone who thought of me with love used it. It's like a grandfather's pocket watch passed down, you feel the quality when you hold it, you remember the time period, and you imagine your young grandfather rushing for a train or sitting in an elegant library. It's a piece of someone's life, and now all of their dreams and love are passed to you. When you are in a difficult situation you can look down at that watch and be reminded that someone has been in your situation, and someone that shares your genetics has gotten through it. Heirlooms to me, have as much character, adventure and love as a classic novel. When I was home for Christmas, I planned a day to explore my dad's childhood home's attic. My family lives on the south side of Chicago, in the historic Beverly/ Morgan Park neighborhood. The home my dad grew up in is still in our family, and has this wonderful attic that feels like a combination of alice and wonderland and Narnia. I have found amazing things there, I got this bright yellow suitcase from 1920s France that belonged to my Grandfather's cousin's wife. Her name was Elizabeth Samson and she went to Oxford. There was a photo of her when we opened the case and antique french books. She lived in 1920s France, and had amazing style. I found this beautiful wallet, that is black leather with a art nouveau gold print and a red satin lining. It is so classy and beautiful, even the hardware is stylized and quality. This is maybe where is all began. I used the suitcase for my thesis show, and am still amazed at the 1920s era travel tags from France to Midway airport. The wallet was amazingly like new, and I use it probably more than I should. There is just so much character to it, and I wonder what Elizabeth was like. I wonder if she knew that one day a relative would hold something she used daily so dearly? There was earrings too, they have these rings of rhinestones and jade and turquoise beads topped with gold crowns. They are glamorous and unique, and so perfectly my style. I couldn't believe them when I found them, they looked like something that is so my style I couldn't of even imagined them. They are classic with something special, an extra little pazazz that shows your different than the rest. I am amazed at the quality and style of these items and the love and uniqueness I feel when I use these items. I wanted other people to be able to have that feeling, like an item is made just for them and of quality material and love. I love to think of the business men of the 1940s who wore leather dress shoes to work everyday, hopefully with intricate punch work. The shoes formed the shape of their feet and after a while, acted as a journal of their motion and day. You didn't just throw your shoes out, you took care of them and got them polished and resoled. I think a lot about how amazing it would be to have more tradesman and higher standards. Wouldn't it be green and made in America, if things were made of quality materials and people kept up with them? I realize now that there was quite an intro to this entry, but don't worry the photos will be the payback. Let me get back to the point, I went to Chicago near Christmas this year and as part of my research for my brand, Well-Loved, I explored my family's attic. I went there on a freezing day and found a dresser full of clothing: lingerie, bright and quirky printed baby clothes, and dress with beautiful prints and embroidery. 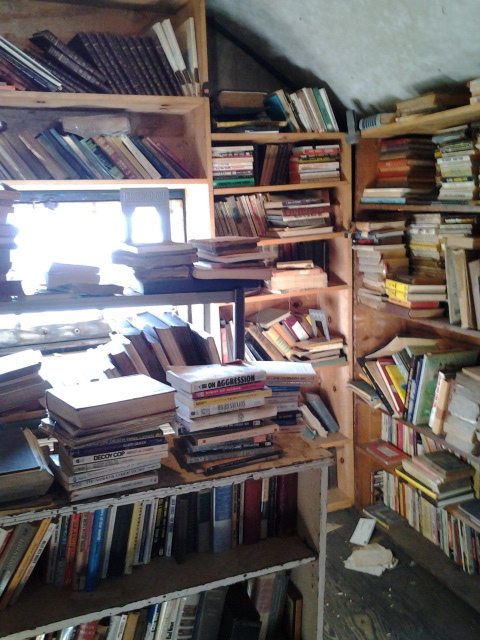 There is a small room with a variety of classics and books from 1930s onward. 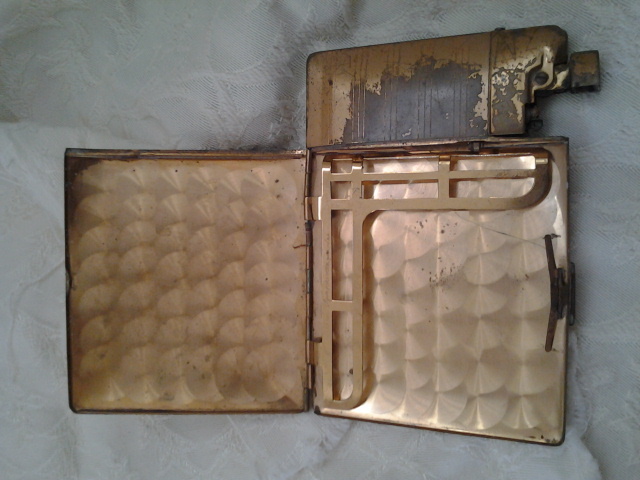 There was jewelry and compacts from my great grandmother. There was a metal box covered in prints of crowns that had metals and cufflinks from World War I. There was portraits of ancestors, and little pieces of their lives everywhere. There is so many things in the attic, but it's a beautiful adventure to go through it all. You find something new every time and each item there has a connection to my family history. I will let you enjoy the images now of some of the things I discovered.